When I first bought my condo two years ago, my initial project was to PAINT. Admittedly, I went a tad crazy at first–having been an apartment dweller for so many years–not allowed to put a nail in the wall without being charged. At move in, my second bedroom/office/writing room was a b-o-r-i-n-g neutral. Which is NOT conducive to the creative process. So…going first for the obvious, I painted an accent wall. Black. But, it turned out too dull and too…depressing. Even for me, who loves black. Color #2 was blue. Bright blue. Clown blue. Err!–overkill. Next was deep purple. (shown over there.) Along with this purple, I also painted the other three walls a pretty silver. 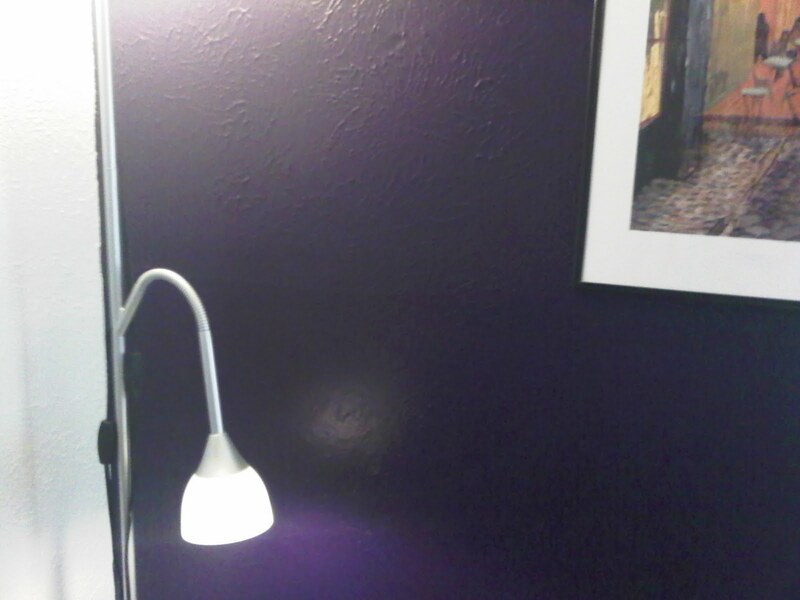 The accent wall stayed purple for the longest, over a year. I liked it well enough, but lately, I’ve been itching for a change. Maybe a RED? Something so bright and stimulating that my retinas would burn. Nice. I finally put the room back together last night and am very happy with the results. I can see myself being oh-so creative in this room now. Yeeee! I smell a Pulitzer!